Populäre Kultur (Fernsehen, Computerspiele und neue Formen wie das Internet) sind in den letzten 30 Jahren anspruchsvoller geworden und fördern damit die Fähigkeiten der Nutzerinnen und Nutzer. This book is an old-fashioned work of persuasion that ultimately aims to convince you of one thing: that popular culture has, on average, grown more complex and intellectually challenging over the past thirty years. Computerspiele (bei Johnson meistens Adventure-Spiele) mögen zwar thematisch nicht sehr anspruchsvoll sein, aber sie trainieren die allgemeine Problemlösefähigkeit der Spielenden und sind damit in dieser Hinsicht anspruchsvoller als Filme oder Bücher. Popular culture is often seen as nothing more than the production of endless entertainment video games, computer games, hand-held games, movies and music on computers. It's common currency to talk about the declining standards of today's culture to say that modern media is dumbing us down. 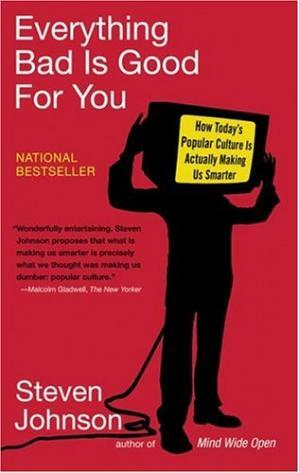 In this complex and tautly written book, Steven Johnson presents a radical alternative: mass culture is making us smarter by consistently demanding more of our brains. So whether you watch The Sopranos or Survivor, turn on and tune in.